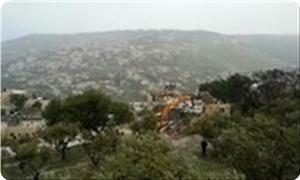 Jewish settlers used bulldozers to level dozens of dunums of agrarian land in Yanun hamlet to the south of Nablus city on Monday morning. 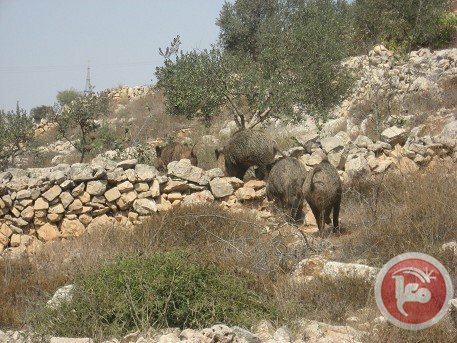 Ghassan Daghlas, an activist against Israeli land grab in northern West Bank, said that the settlers bulldozed more than 20 dunums of land in Ulwana area between Yanun hamlet and Aqraba village. He said that the settlers want to annex more land in order to expand their agricultural land lots along the Yanun road, north east of Aqraba. Israeli soldiers continued Monday and for the second day in a row raiding homes in Hebron, trashing people’s belongings and arresting residents while Israeli settlers teamed up with the soldiers in terrorizing the civilian Palestinian population in the city, according to security sources. The army and settlers campaign against Hebron residents came a day after an Israeli soldier was shot and killed near the Ibrahimi mosque (Cave of the Patriarchs) in the old city of Hebron. Israel said it believes a Palestinian was responsible for the shooting even though no Palestinian group took responsibility for it. Immediately after the shooting, Israeli soldiers set up road blocks on all entrances to Hebron, prevented people from leaving or entering the largest West Bank city and conducted extensive search campaign to catch the shooter. In the process, Palestinians said the soldiers broke into many homes, destroyed furniture and belongings and arrested a number of people. 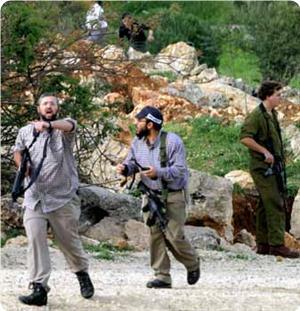 Settlers also attacked Palestinian homes located in the vicinity of the settlements in an apparent revenge act. 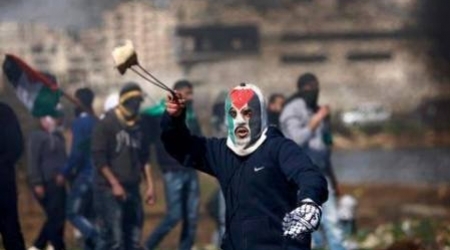 Meanwhile, residents clashed with soldiers on the contact points between the Israeli-controlled old city, known as H2, and H1, the Palestinian-controlled area. 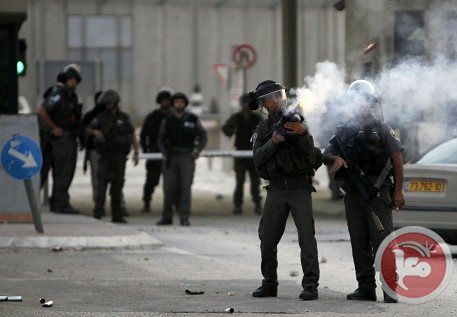 At least 11 people were injured from rubber-coated metal bullets and suffered from tear gas inhalation fired by the soldiers. Israeli officials also called on their government to stop the negotiations with the Palestinians as a result of the shooting. Israeli Prime Minister Benjamin Netanyahu has also called on settlers to occupy a Palestinian-owned building in Hebron, not far from the shooting place, in what he said was a response to the killing of the soldier. The building in question is under litigation as Palestinians have questioned the settlers’ takeover in Israeli courts and demanded its return to its lawful Palestinian owners. 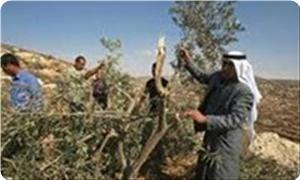 A group of armed extremist Israeli settlers attacked a Palestinian orchard, south of the northern West Bank city of Nablus, and uprooted its trees. “Death To Arabs” Graffiti found near Tel Aviv. Ghassan Daghlas, in charge of Israeli Settlements File at the Palestinian Authority in the northern part of the occupied West Bank, stated that the settlers illegally occupied the land before uprooting it. He added that dozens of settlers arrived into the area, located near the Awarta-Aqraba road, close to the Itamar illegal settlement, and carried out their attack while Israeli soldiers, who arrived at the site, did not attempt to stop them. The attack came a few hours after Israeli Prime Minister, Benjamin Netanyahu, decided to boost settlement activities in the occupied territories, and to allow the settlers into a Palestinian home in Hebron. The settlers were removed from the home back in April of 2012 after the then-Israeli Defense Minister, Ehud Barak, issued an order in this regard following an Israeli court ruling. 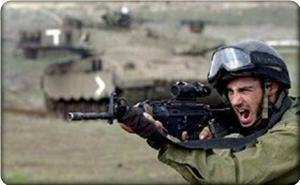 Netanyahu attributed his decision to the death of the two Israeli soldiers on Sunday and Friday in the West Bank. In related news, Israeli extremists wrote racist graffiti on a wall in Bat Yam area, in the center of the country. The settlers wrote “Death To Arabs”, and “Revenge”, referring to the death of two Israeli soldiers killed in two separate attacks in Qalqilia and Hebron over the last 48 hours. Israeli police spokesperson for Arab Media, Luba Samri, stated that the extremists used black spray paint to write the graffiti. She claimed that the Police in Tel Aviv rushed to the scene, and is conducting an investigation into the incident. Last week, Israeli soldiers shot and killed one Palestinian, and injured four, including three children, in different attacks carried out in the occupied Palestinian territories. 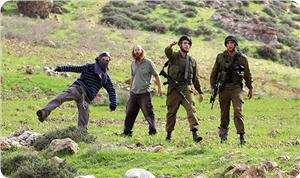 The army carried out 49 invasions into Palestinian communities, and kidnapped at least 41, including nine children. Two Palestinians have been killed, and dozens have been injured, by Israeli army fire, while hundreds were kidnapped since the beginning of the month. Following the deadly shooting of an Israeli soldier in Hebron city, in the southern part of the occupied West Bank, Israeli Prime Minister, Benjamin Netanyahu, vowed to boost settlement activities, and ordered the Civil Administration, to take all needed measures to allow the return of Israeli settlers into Palestinian home they previously occupied in Hebron. 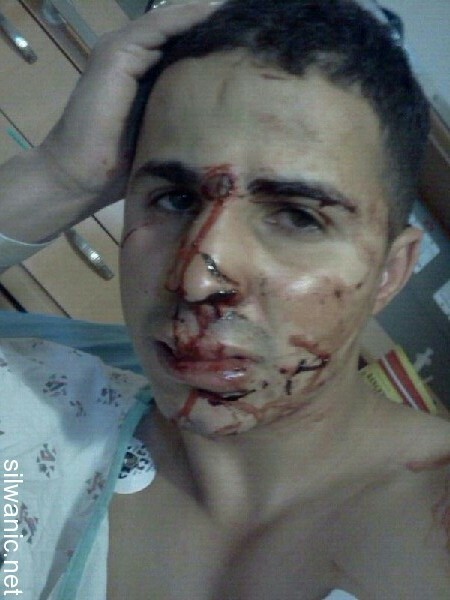 The Israeli Civil Administration Office is run by the Israeli military in the occupied West Bank. 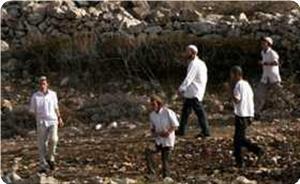 Back in April of 2012, a group of settlers was removed from the home, near the Ibrahimi Mosque in Hebron. They allegedly purchased the property but the purchase was deemed invalid, especially since such deals must be first approved a commander of the Israeli occupation army. The settlers were removed after the then-Israeli Defense Minister, Ehud Barak, issued an order in this regard following a court ruling. The decision to allow the settlers to return to the property was made on Sunday at night; Netanyahu said that the settlers “must be allowed into the home without any delay”. After being removed from the property, the settlers filed several court appeals, demanding a recognition of the alleged transaction, while Israeli Defense Minister, Moshe Ya’alon, also vowed to do whatever he can to authorize their “return to the home”. Netanyahu made his decision hours after a Palestinian sniper shot and killed an Israeli soldier in Hebron, following ongoing tension that led to clashes between the soldiers and dozens of local youths who hurled stones at them. 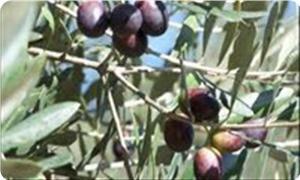 It is also related to the death of an Israeli soldier who was killed two days ago in the Qalqilia district, in the northern part of the occupied West Bank. “Anyone who attempts to remove us from Hebron, from the city of our patriarchs, will just achieve the exact opposite”, Netanyahu said according to Israeli daily Haaretz, “We will boost our settlement activities”. Netanyahu said that the “return” of the settlers to the Hebron home would still have to go through legal means”; yet, he ordered all related government facilities, to do whatever they can to ensure their fast return. His decision comes despite the fact than an appeals committee, looking into the purchase did not recognize the documents presented by the settlers, but criticized the way this purchase was denied. Haaretz added that, should the process be finalized, Netanyahu and his Defense Minister could sign off the deal, and authorize the settlers back. Bennet, of the Jewish Home Party, who also serves at the Ministerial Council, said that “the release of Palestinian prisoners is based on progress of talks, and our duty should be a war on murderers…” according to the official. Israel’s Transportation Minister, Yisrael Katz, said that he previously voted against the release of any detainee, and that the release of what he called “terrorists” encourages others to attack Israel. Following the fatal shooting of the Israeli soldier in Hebron, the army initiated a large campaign, broke into and searched hundreds of homes, close to the Ibrahimi Mosque area where the soldier was shot. 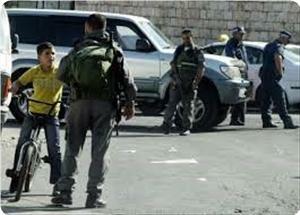 Hundreds of Palestinians were kidnapped, and where rounded up in the southern area of the occupied city of Hebron. The soldiers also occupied rooftops of several homes, using them as monitoring towers, while the army operated in the area. The military declared Hebron a closed military zone, preventing the Palestinians from entering or leaving it. 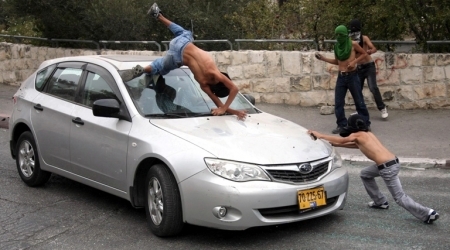 The army carried out 49 invasions into Palestinian communities, and kidnapped at least 41, including 9 children. Two Palestinians have been killed, dozens have been injured, and hundreds were detained, by Israeli forces since the beginning of the month. 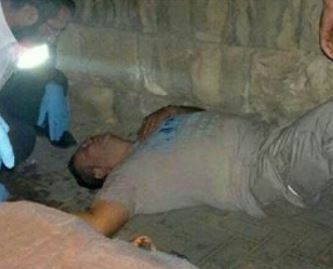 Israeli forces Sunday shot and injured a 22-year-old Palestinian while offering protection and accompanying Israeli settlers into the historic Hebron tomb, in central Hebron, to allow them to perform prayers there, according to security sources. 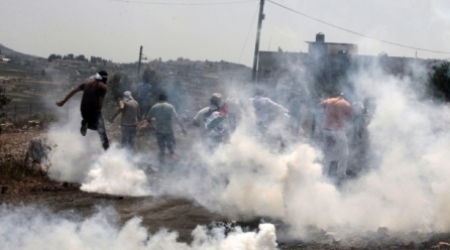 Forces fired tear gas canisters and rubber-coated steel bullets toward the provoked Palestinian residents who gathered to prevent settlers from entering the tomb, leading to clashes. 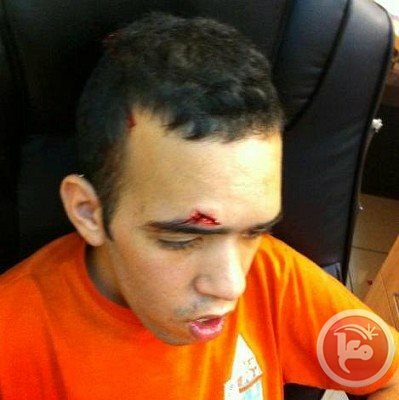 Nimr Salaymeh, 22, was shot with a rubber-coated steel bullet in the neck and was transferred to hospital for treatment. 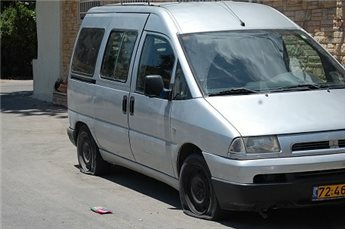 Suspected Israeli extremists punctured the tires of six Palestinian vehicles in East Jerusalem on Sunday and sprayed graffiti. 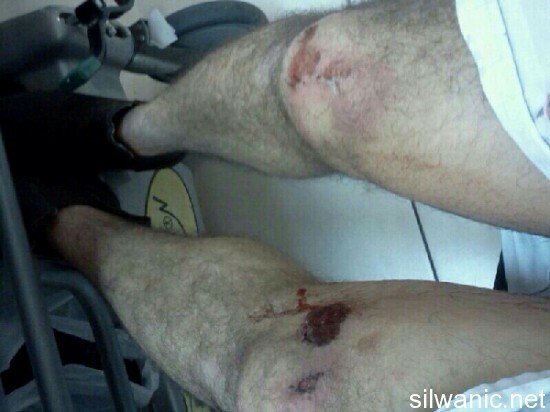 Imad Muhaisen al-Kaswani, a resident of Sheikh Jarrah, told Ma'an that two Israelis passed through the neighborhood at 4 a.m. and punctured the tires of six cars using tools. They also sprayed "price-tag" on a neighborhood wall. Members of the al-Kaswani family tried to chase the extremists, but they fled the scene. Surveillance cameras in the neighborhood filmed the attack. The cars belong to the al-Kaswani, Shamsana, Zahran, Hijeh and Salim families. 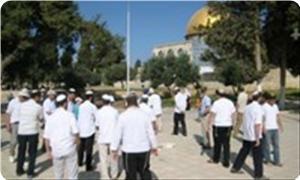 More than 141 Israeli settlers escorted by Israeli soldiers stormed Al-aqsa courtyards on Sunday morning. Palestinian sources said that extremist settlers, who were dived into four groups, roamed about the place amid Al-Aqsa worshippers and employees in an atmosphere surcharged with anger and tension. The source added that a number of worshippers inside the mosque tried to counter the settlers by raising slogans acclaiming "God is great," and from a shield to protect Al-Aqsa mosque. The Israeli setters have recently forced the pace of storming Al-aqsa mosque amid Palestinian fears of Israeli plans to juidaize the holy city. A number of settlers gathered on Friday at the entrance to Aroub refugee camp in the north of the city of al-Khalil under the protection of the Israeli occupation forces. Eyewitnesses told PIC that a group of settlers, protected by Israeli soldiers, arrived to the entrance of the camp and that one of them performed Talmudic rituals and then started singing and chanting racist slogans. 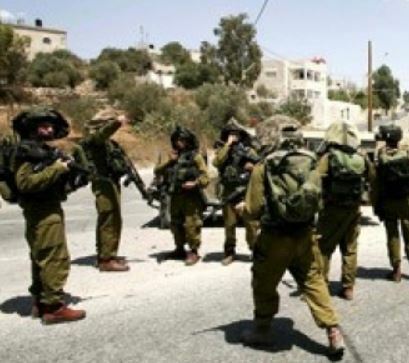 The witnesses said the soldiers fired tear gas grenades in Jawabra and Fadhilat streets in the Aroub camp before withdrawing with the settlers. Meanwhile, the Israeli troops on Friday afternoon set up a checkpoint on the road to the Gush Etzion settlement, established on lands north of al-Khalil, and arrested a Palestinian young man. 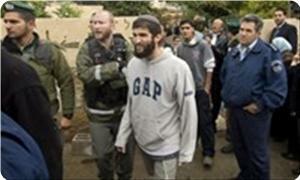 The detainee was transferred to the settlement of Kiryat Arba to the east of al-Khalil. 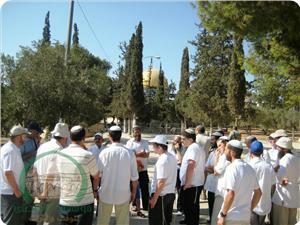 Dozens of Jewish settlers on Thursday stormed the Aqsa Mosque, while other groups of settlers gathered along the roads leading to the Mosque and performed Talmudic rituals on its gates. 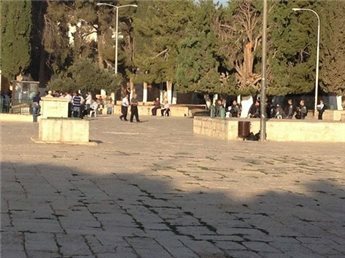 PIC's correspondent in Jerusalem said that a group of settlers stormed the Aqsa Mosque from the Maghareba gate, guarded by large police forces, and toured in its courtyards. 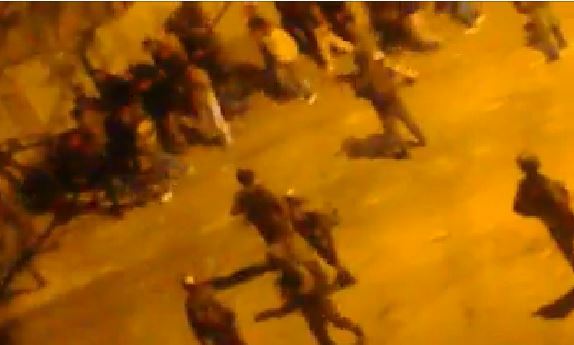 Other groups of Jews raided "Souk Qattanin" on the road leading to the Aqsa Mosque, and performed Talmudic rituals at the doors of the shops after the police forces forced the shopkeepers to close them. These raids come in light of repeated calls by settler groups to organize mass incursions into the Aqsa Mosque on the occasion of Jewish holidays. 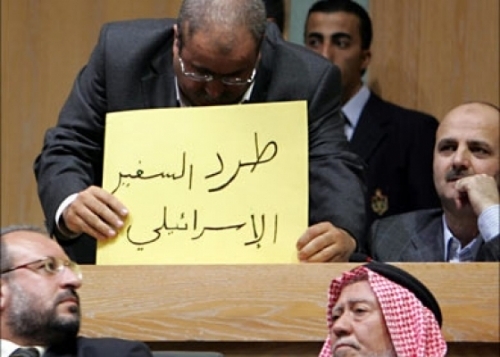 81 Jordanian MPs called on their government to summon Israel's ambassador to Jordan, Daniel Nevo, and confronted him about the Israeli government's illegal measures; particularly in allowing extremist Jewish settlers to prevent Muslim worshipers from praying at the mosque. 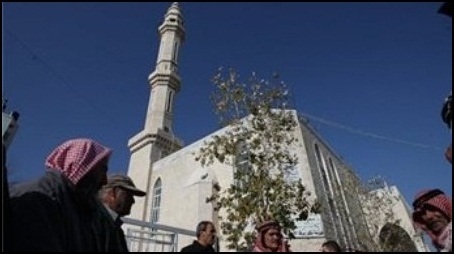 The MPs requested, in a memo, that the Jordanian government summon Israel's ambassador and called on the the Jordanian parliamentary speaker, Khalil Attyeh, "to address the Islamic and Arabic parliaments about the practices and violations of Jewish settlers against holy places." It's worth mentioning that the Jordanian parliament unanimously voted in May 2012 to expel Israel's ambassador from Amman and demanded the recall of Jordan's ambassador to Israel in response to the brutal measures practiced by settlers and encouraged by the Israeli government, against the Palestinians and their holy places, including the Al-Aqsa Mosque. 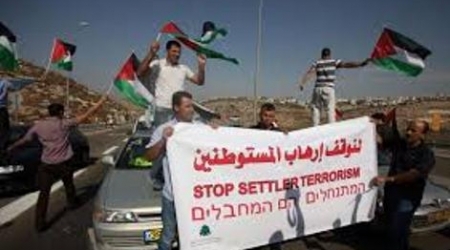 Central Bureau of Statistics Center said the number of Israeli settlers in the occupied West Bank has risen by 5%, an increase at three times the rate of population growth in (Israel) which is 1.9%. 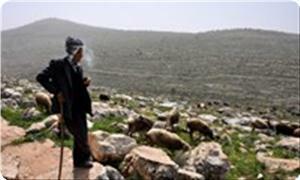 The Center indicated that the number of settlers in 2012 reached about 341 400, an increase by 16.200. The number of births, who numbered 11100, constituted nearly 68.5% of the population, while the remaining increase of 31.5% was due to the relocating of 5100 Israelis to settlements. 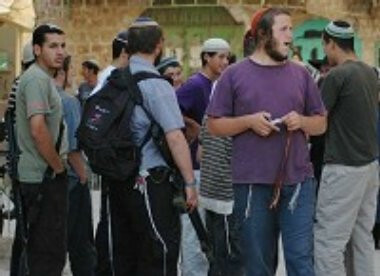 In 2009, the number of settlers living in the occupied West Bank amounted to 296.700, while in 2011, they numbered 325.200. 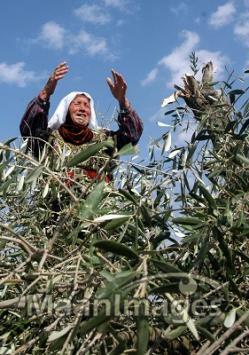 More than half of the settlers lived in 5 of the total of the 130 settlements, according to the center. The Modein settlement is the largest in the occupied West Bank, with a population of 55.566, followed by the Beitar Illit settlement with 42,467 residents. About 18176 settlers live in the Ariel settlement, and about 13466 in the Givat Ze'ev. In a step that could trigger a third intifada against Israel, the Knesset interior committee confirmed during a meeting on Monday afternoon that the Jews have the right to freely enter the Aqsa Mosque and perform their rituals while carrying the Torah book under police protection. The committee also discussed the mechanisms for enabling the Jews to visit what it described as the temple mount without any restrictions. The Aqsa foundation for endowment and heritage, in turn, highlighted that the Aqsa Mosque is a purely Islamic place belonging to the Muslim Nation alone and the other religious groups have no right to a single grain of its soil. It also stressed that the Israeli occupation regime and its institutions have no right to interfere in the affairs of the Aqsa Mosque and the jurisdiction of the Islamic Waqf Authority. It said that the continued presence of Muslims at the Aqsa Mosque is the only means at the present time to protect it against the Jews and appealed to Muslims all over the world to rise to save their Mosque from the clutches of the occupation, especially since the Jews recently escalated their violations against it. 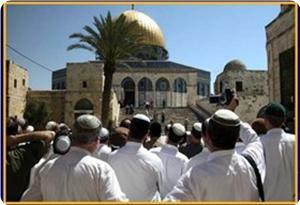 The Jewish groups from all spectra intend as of tomorrow, September 18, to start organizing massive visits to the Aqsa Mosque on the occasion of the Sukkot holiday as a prelude to turning the Mosque into a permanent shrine for the Jews. Israeli Right-Wing lawmaker Moshe Feiglin has called for the expulsion of al-Aqsa Mosque's guards who were appointed by the Islamic Waqf Authority, Hebrew media sources said. 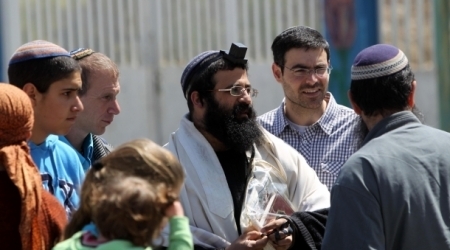 The Israeli MK claimed that the Jewish worshipers are frequently subjected to those guards' harassment. He also called for allowing Jews' free access to the holy mosque in order to perform their rituals. 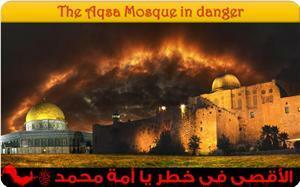 He denied that the Israeli authorities had granted in 1967 the Islamic Waqf Authority full control over the Mosque. 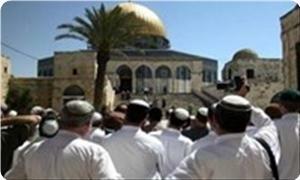 Meanwhile, the Aqsa Foundation for Endowment and Heritage said that the Israeli Knesset is planning to discuss on Monday preparations for "Jewish pilgrimage to the Temple Mount during Sukkot and the lessons learned from the pilgrimage of Jews to the Temple Mount on Rosh HaShana", according to the Knesset Website. 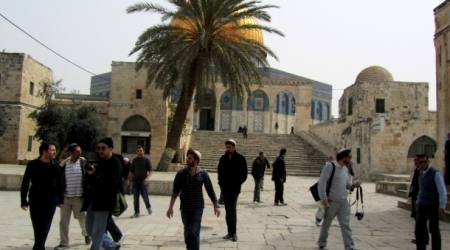 The Foundation said that the session constituted a green light to the Jewish settlers to escalate their break-ins into al-Aqsa mosque during Sukkot, next week. About 12 Israeli bodies are scheduled to attend the session including Police, Foreign, Religious, and Interior ministries in addition to PM office. The Israeli authorities are scheduled to organize three events in occupied Jerusalem to mark Sukkot where thousands of Jews are planning to storm al-Aqsa Mosque. Scores of Jewish settlers escorted by ultraorthodox rabbis desecrated the courtyard of the Aqsa Mosque under police protection on Sunday morning . According to eyewitnesses, the rabbis gave explanations about the alleged Jewish temple. The eyewitnesses said that hundreds of Palestinian religious students were present at the Aqsa Mosque during the settlers' guided tour, while the Israeli police at the gates prevented many students from entering the Mosque and confiscated their IDs for a while. 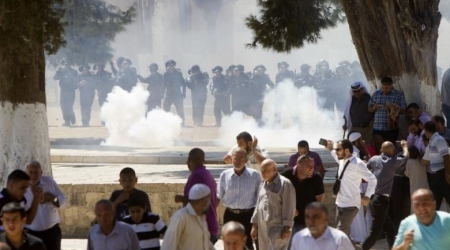 Jerusalemite sources said that there has been a state of extreme tension at the Aqsa Mosque and its environs for days after Jewish groups threatened to desecrate it every day at the pretext of performing rituals and celebrating Jewish holidays. For its part, the Aqsa foundation for endowment and heritage said that the office of the Israeli premier financially support the intended Jewish pilgrimage march to the Old City of Jerusalem and the Aqsa Mosque, which will be organized by extremist Jewish groups next week. The Aqsa foundation added that the so-called Jewish temple groups declared intention to organize a march for Jewish children on September 24 to the Aqsa Mosque and to storm it again during “Sukkot” festival along with thousands of Jewish settlers to perform rituals. The foundation warned that the Israeli occupation regime is accelerating its plan to divide the Aqsa Mosque and allow the Jews to perform their prayers at specified times every day. The Aqsa Foundation for Endowment and Heritage (AFEH) said that an International Jewish march to Jerusalem is being organised to take place during the Jewish festival of Sukkot 19-26 September. AFEH said in a press statement that the organiser announced the march to take place on 23 September, under the slogan “we all meet on the way to Jerusalem”. The organisers will provide tents along the routes to Jerusalem and the march will end with a music festival the next day. The organisers also said that the Jewish municipality of occupied Jerusalem and the occupation government will help the organisers to make a success of the event. The organisation added that there are many Zionist plans to Judaize Jerusalem, the latest of which is “built Jerusalem”, which aims in principle to build the temple on the ruins of Al-Aqsa and turn it into a place of pilgrimage to Jews around the world. AFEH explains that this plan talk openly about taking over the Aqsa Mosque, demolishing both the Dome of the Rock an the Southern Mosque as well as some of the walls surrounding the Aqsa Mosque and some old city walls built during the Ottoman period. Then building the temple with its centre over the ruins of the dome of the rock and its facilities at the fringes of the Aqsa Mosque, with the main facilities being built on the ruins of the Southern Mosque. The organisation pointed out that amongst the leaders of this trend is Yehuda Etzion, and extremist Jew who was caught in the early eighties of the last century, with a group of extremist Jews planning to blow up the Aqsa Mosque. The extremists behind the plan talk about building a grand temple on the ruins of the Mosque which will be visited by 10 million Jews from around the world every year to perform their pilgrimage and see sacrifices being offered there, according to AFEH. Israel's Internal Security Minister has informed the Knesset Deputy Speaker that the Israeli police will prevent the Jerusalemite children from playing in al-Aqsa mosque yards, Maarif Hebrew newspaper said. The police decision came following Knesset right-wing members' demand to prevent Palestinian children from playing Football in the mosque yards claiming that they are playing in a Jewish sacred site. The Israeli settlers have escalated their break-ins into al-Aqsa mosque as part of the Israeli scheme to divide the mosque.